Cheap flights to Portugal: Prague-Lisbon for €110! All travellers wanting to visit capital of Portugal can now enjoy a great deal: cheapest tickets to Lisbon can be booked now for January and February. 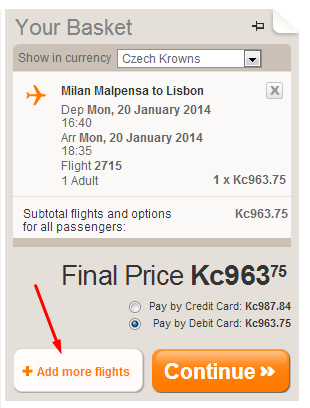 Return flight from Prague to Lisbon is available for €110 / 2750 CZK! This price is valid if you travel with cabin luggage up to 10 kg. Normal price on direct flights operated by TAP is €240, so you save more than 50%! To reach this price, you have to combine flights of two airlines, Easyjet and Ryanair. These flights have perfect connecting options as you will spend only about 2 or 3 hours at the airport waiting for your next flight. To reach the best price, use “Add more flights” button while booking with Easyjet (check the screenshot) – if you would make the reservations separately, you would have to pay booking fee for each of the 3 flights. Book directly via Easyjet and Ryanair! « Cheap flights to Hong Kong until June 2014: only €494!